Managing a baseball team, school club, or fraternity can be a rewarding experience. It can also be a total nightmare, at least when it comes to getting everyone to cough up their dues. WePay is a very promising startup in private beta that’s looking to fix group payments for good. Earlier today news broke that the company had raised $1.65 million from August Capital and some angel investors. That’s obviously great news for WePay, but also impressive is the company’s roster of angels: as of tonight the company can count PayPal cofounder Max Levchin as an investor. Given Levchin’s experience in this industry, that’s a very strong endorsement. PayPal alum Dave McClure is also onboard, as are Paul Buchheit, Ron Conway, Mark Goines, Andrew McCollum, Joe Campanelli, and Angus Davis. WePay is also a part of the Y Combinator program. So what exactly does WePay do that PayPal can’t? The difference stems from the way payment accounts are set up. With PayPal, your account is tied to your name, without any way to separate the payments associated with your soccer team from those of your fraternity or your own personal transactions. On WePay, you can create a unique, FDIC insured account for each of these. The account is still associated with your name, but you can keep each group account totally separate. This gives you much more freedom than you’d have otherwise. 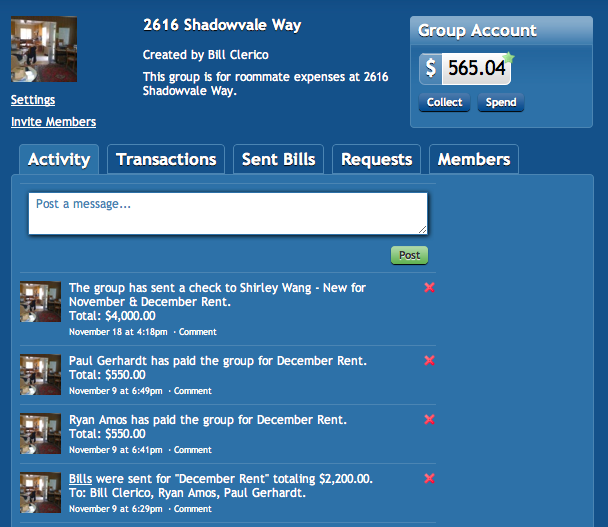 If you want to share your fraternity’s transaction history with the entire group, you can do that without having to worry about a personal transaction ever popping up. The site comes with controls for specifying who can have access to these histories. There’s much more to WePay, of course. The site can also fully manage the payments to and from each of these accounts. If you need to collect money from your soccer team, you can automatically shoot an Email to each player informing them how much they owe. They can pay immediately through the website using a credit card or direct account transfer, or they can submit a check. If they don’t pay soon, the site will automatically remind them a few days later. If you’re managing a WePay account, you can also sign up to receive a special WePay credit card that draws directly from the shared account. WePay makes money by charging a 3.5% transaction fee (there’s also a different plan that charges 50 cents per transaction and limits you on the methods of payment you can accept). WePay looks like it could be a winner. The company is solving a problem that nearly everyone has had to deal with, and they’ve got a proven way to make money doing it. Look for their launch early next year.